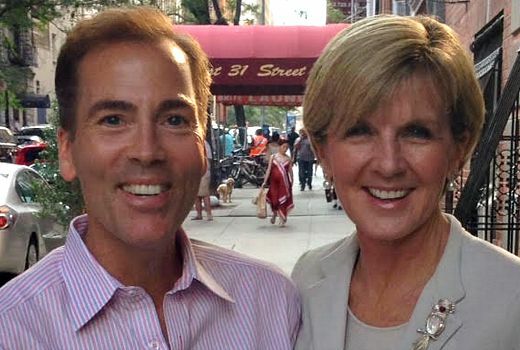 Sunrise entertainment guru Nelson Aspen had his second encounter with Minister for Foreign Affairs in New York last week when they again crossed paths in a TV studio. The odd couple first became acquainted last November when they were both booked for satellite crosses to Australia, and cameras captured an impromptu conversation. Aspen tells TV Tonight the pair stayed in touch after hitting it off. “Afterwards we became pen pals and have been trying (in vain) to figure out get-togethers in NYC/Oz. She invited me to her Christmas party. I invited her to my Opera House show,” he said. But the latest surprise meeting was very early a wardrobe malfunction due to a New York heatwave. “I arrived for my cross in a t-shirt, shorts, flip flops and was told ‘my pal the Foreign Minister’ would be at the same satellite facility. I keep shirts here, but since I’m only seen from the waist up on Sunrise, I was completely unprepared! Thankfully for Aspen, it did the trick.